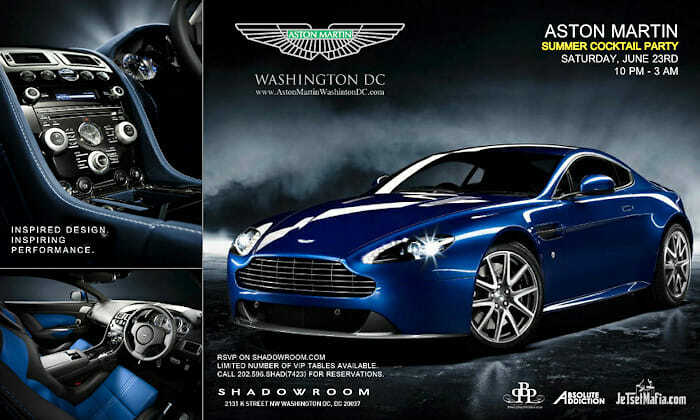 On Saturday, June 23, Aston Martin is hosting a summer cocktail party at Shadow Room, 2131 K Street NW. There will be several cars from the luxury car company on display, as well as reps in attendance to answer any questions you may have about Aston Martin. DJ B. Hill will be spinning a mixture of house, hip hop and top 40. Guests that RSVP via ShadowRoom.com will receive complimentary Ketel One cocktails from 10-11pm. To reserve a table, call 202.596.SHAD(7423). Limited number available.